Q. How do I cite using APA? Get citations for COM library print books, eBooks and media from WorldCat. Note: If the books is not from our library, it will still work, just change the initial pull down menu from College of the Mainland Library to Libraries Worldwide. Go to WorldCat and search for your book. Click on your style to get the citation. Note: You may need to tweak the formatting a bit. 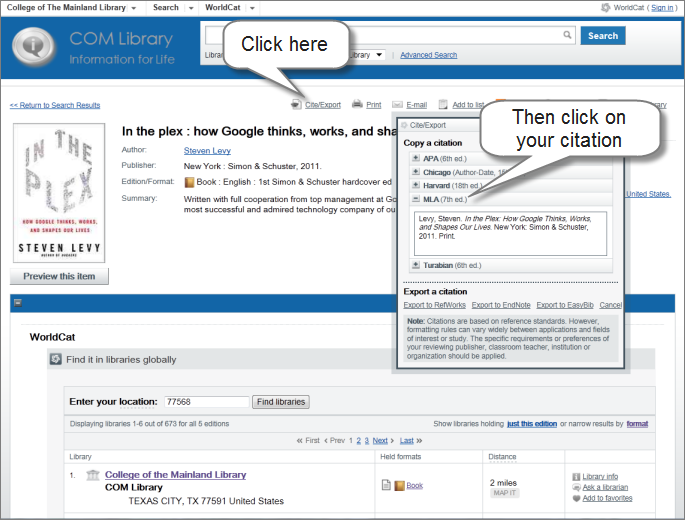 Check the Cite the Easy Way! tab in the Cite APA or MLA Style libguides. 1. Make sure it is formatted double spaced with a .5" hanging indent on your works cite page.